You can mirror exactly what you see on your iOS Device or Mac to your TV by using an Apple TV. So you can show everyone in the room what’s on your display (web pages, videos, games, etc.). It works wireless and supports zooming and device rotation. On Mac with OS X 10.9 (Mavericks), you also can extend your Desktop to the AirPlay Device (as known from second computer displays, that means not just mirror your first screen). What hardware and software do you need? Of course, sender and receiver have to be in the same network (either connected via Wi-Fi or Ethernet). If there’s an Apple TV in your network, the AirPlay menu appears in the menu bar (upper right corner of your display, see left screenshot). 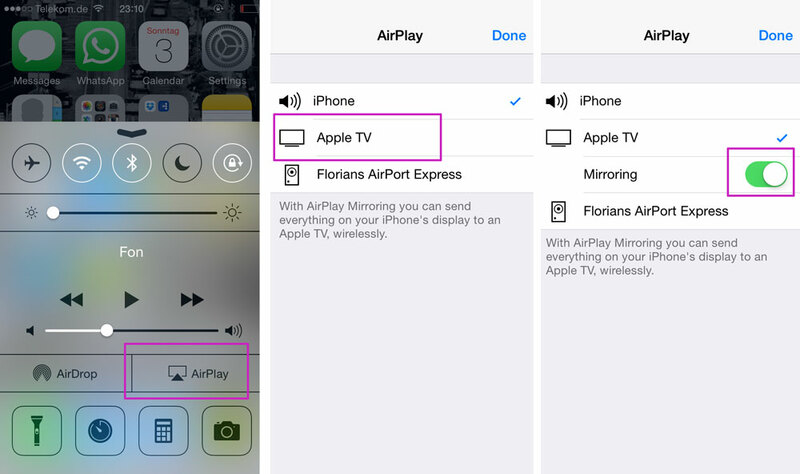 Just click your Apple TV and the AirPlay Mirroring will start. You can find the corresponding options also in “System Preferences > Display”. Next Next post: Does my Mac support AirPlay Mirroring? I’m using the app and can see the airplay from my mac but can’t get any sound. Any ideas? Can’t figure out how to mirror my Macbook Air to my Amazon Fire TV Stick. Any ideas please? Have you seen http://streaming-blog.com/how-to-use-airplay-amazon-fire-tv/ ? I was using the interactive whiteboard after mirroring and interference then occurred with a code number appearing on the screen and information I was using being blocked out. Is it possible a pupil was trying to mirror onto the whiteboard and as a result was causing interference?